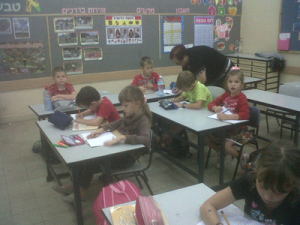 A class at the Matara School in Petah Tikva. It is just after 4 P.M. in Petah Tikva, a working-class town in central Israel, and a group of chattering schoolchildren are making their way past a heavy metal gate and through a cracked concrete courtyard. The children, immigrants from the former Soviet Union or children of immigrants, are walking to a pale-yellow stucco building for their second shift of studies for the day at the Matara School. The after-school program has classes in math, Russian, English and Hebrew for elementary-school kids. The classes, held twice a week, for three hours a day, are taught by Russian immigrants, many of whom were teachers in the former Soviet Union. Called evening schools, institutions like Matara are popping up throughout the country, especially in cities with large Russian populations. The proliferation of these programs as well as the opening of a number of public schools catering to Russian children is largely the response of the Soviet immigrant community to problems in the Israeli public school system. For the past several years, schools have seen sinking scores on international standardized tests, with Israel ranking among the lowest in Western countries. In addition, there is a vast gulf in attitudes toward schooling. Education in the former Soviet Union is an intense affair with long school days, strict discipline, a focus on math and sciences, several hours of homework and a built-in system of competition. In Israel, school days tend to be short and students call teachers by their first name. Teachers struggle with class sizes of up to 40 children, and low salaries make it difficult to recruit teachers. Lack of discipline is common; homework is not usually assigned until the fifth grade. “Encountering the schools here, immigrant parents go into another level of culture shock,” says Olena Tabachna, principal of Matara. Tabachna ran a school in her native Ukraine. She works from a small office that doubles as the school’s headquarters. Parents appreciate the arrival of schools like Matara. Olga Rekun, originally from Moscow, was relieved when Nicole, her slim, 7-year-old daughter, started attending Matara. “It’s like her learning chakras were opened,” she says. Rekun describes Nicole’s regular school day as chaotic, with 28 children jostling for attention in class and an informal teaching style that Nicole cannot relate to—a common complaint among Russian parents. At Matara, Nicole and her second-grade classmates learn Russian from Ella Panakova, who smiles broadly and enunciates her words like a stage actress. Open on their desks is a booklet of Russian poems, stories and writing exercises. Class size is limited to 12 pupils. Panakova’s young charges line up in front of the class under pictures of Israeli Prime Minister Benjamin Netanyahu and President Shimon Peres. In unison they belt out a series of traditional Russian children’s poems: one about a cat who likes sausages, another a tongue twister about a samovar. They also enthusiastically sing about a tango, swaying and kicking their feet in the air. The children, who have come here after a day in preschool, stand, their small chairs scraping against the floor. Khaitov, who teaches Hebrew, stands at the head of the class holding a flash card. “What is this, class?” she asks. A boy answers: “Sulam,” Hebrew for ladder. The other children repeat the word and clap out its syllables. Tuition at Matara is $80 per month, a price that many immigrant parents struggle to meet. Aliya B’Savta (Aliya as Part of a Team) is a local nonprofit that helps support the Russian-speaking community and subsidizes tuition for many families. Some one million people came to Israel in the decades following the 1989 collapse of the Iron Curtain, an unprecedented phenomenon even for a country built on immigration. The Russian aliya is also unique because of the community’s determination to preserve its cultural background. Evening school programs are proof of the confidence and initiative prevalent in Russian culture, notes Marina Niznik, a sociolinguist who teaches Russian language and literature at Tel-Aviv University. The success of schools like Shevah Mofet—though there are only a handful so far—is another proof of the community’s strength. Shevah Mofet, a full-day school for children in 7th through 12th grades, began in the 1990s as Mofet, a night school for immigrants on the premises of the Shevah trade school. It was founded by Yakov Mazganov, a former professor who was working as a security guard for Shevah. Mazganov attracted other Russian professors to teach at his school. Eventually, Shevah and Mofet merged. Shevah Mofet students have won a number of academic contests, including the International Mathematical Olympiad and the Asian and International Physics Olympiad. Some 90 percent of its 1,100 students are children or grandchildren of immigrants. Classes focus on math, physics and the arts, including music and ballet. Gordon Elementary School is another popular school founded for and by Russian immigrants. Held in the same building as and loosely affiliated with Matara, demand to enroll in Gordon is high, but only children who live in the district served by Gordon can attend. Last fall, parents whose children were not admitted held demonstrations outside its gates. Gordon is so coveted because of its longer day—it finishes at 4:30 P.M., a boon for working parents—as well as its concentration on math, logic, the sciences and Russian. Gordon students tested 10 points higher than the national average in recent standardized tests. Janna Twersky, an immigrant from Ukraine and founder of an association that supports the school, rejects this claim. “It feels like we are being discriminated against,” she says. “People who come from a different cultural and educational background need a school like Gordon or Matara to answer their specific needs. Such schools act as a bridge to integration.” Without these schools, she claims, immigrants children would be neglected educationally. Sofia Elkovsky, a 48-year-old laboratory technician who lives in Petah Tikva, came from Latvia in 1982. She was disappointed by her two oldest children’s progress through the city school system. When it came time to put her youngest child, Tomer, now 11, into school, she discovered Gordon and its evening counterpart.